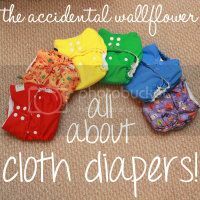 I think I've made my love of cloth diapering pretty clear on the blog. Click here for further evidence :). Check out Harry's newest diaper. 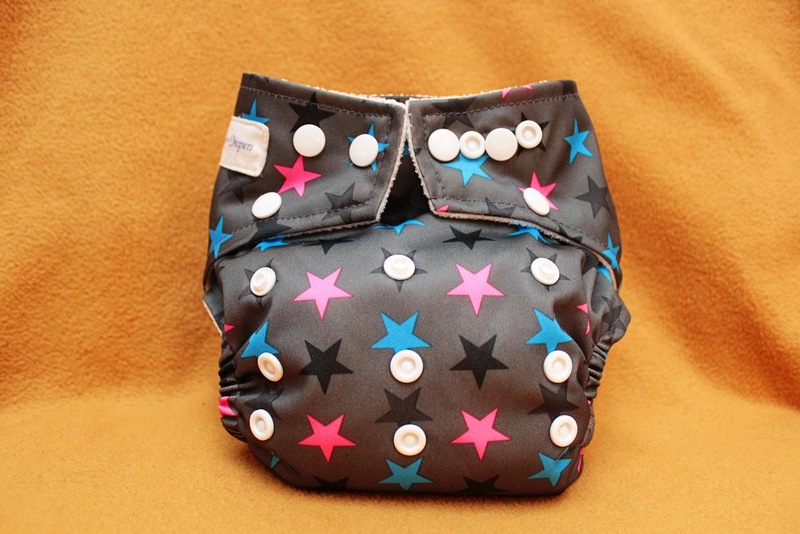 That is a snazzy new Tootie Baby Diaper, cute huh? 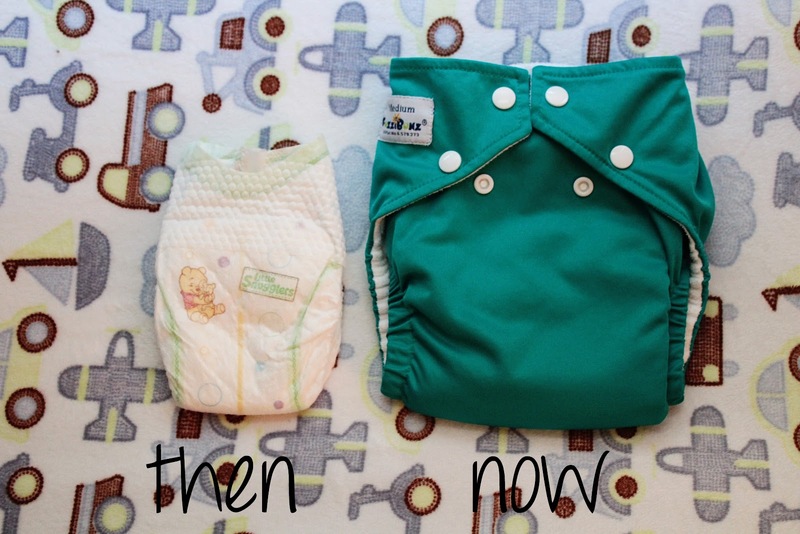 The diaper is a one size pocket diaper with a traditional three snap rise. I put the diaper on the medium setting and it fits Harry just perfectly. Tootie Babies also feature hip snaps, something not all diapers have. I like hip snaps because they make for a more customized fit. The waist snaps overlap on the smallest settings, which is nice for skinny babies. The diapers are generously sized so the overlap is a great feature to have (Harry is on the smallest non-overlapped size). Tootie Babies fit Harry really well, the diaper is quickly becoming one of my favorites in our stash. The diaper is made out of PUL and has a microfleece pocket layer on the inside. It came with one microfiber insert, which is plenty absorbent for daytime use. I prefer snap closures for cloth diapers, but Tootie Baby Diapers can add hook and loop closures to any diaper if you prefer. They also embroider diapers for a personalized look. 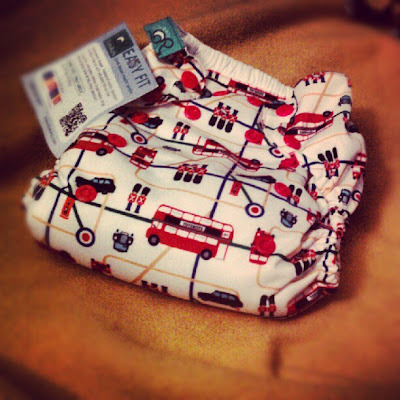 So if you're in the market for some new cloth diapers, definitely check out Tootie Baby Diapers! They have some really adorable prints. The company has graciously offered some specials for my blog readers. At checkout use the code "tootie" to get 30% off or enter "baby" for free shipping off $50 or more. 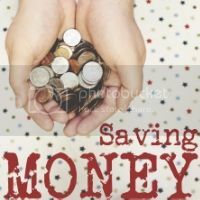 Thanks to Cassie and everyone at Tootie Baby Diapers for offering the discount codes! Disclaimer: I received a diaper free to review. All opinions are 100% my own. 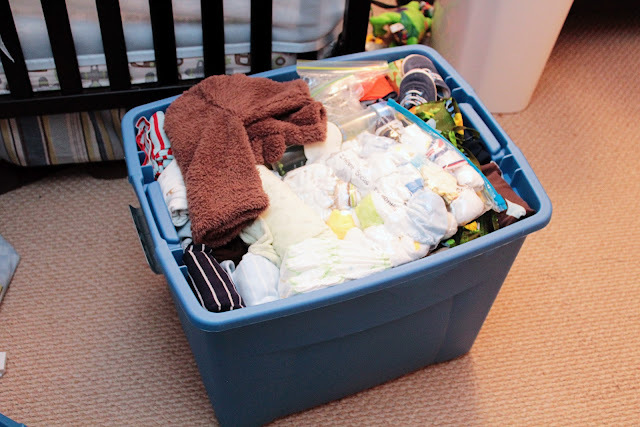 Yesterday I went through Harry's clothes and added the too-small items to the Rubbermaid container we bought a while back. A teensy tiny newborn size diaper! I wish I had saved one of the preemie sized diapers Harry wore during his first few weeks, now those were small! And like the most adorable things ever. Here's Harry right before his bath last night. He was stuffed up until around dinnertime last night. He also had a slight fever all day. I gave him a dose of Tylenol to keep it down. Hopefully it was just a quick 24 hour bug, or teething, although I haven't noticed any new ones starting to come in. Is this week going slow for anyone else? It seriously feels like it should be Friday already! 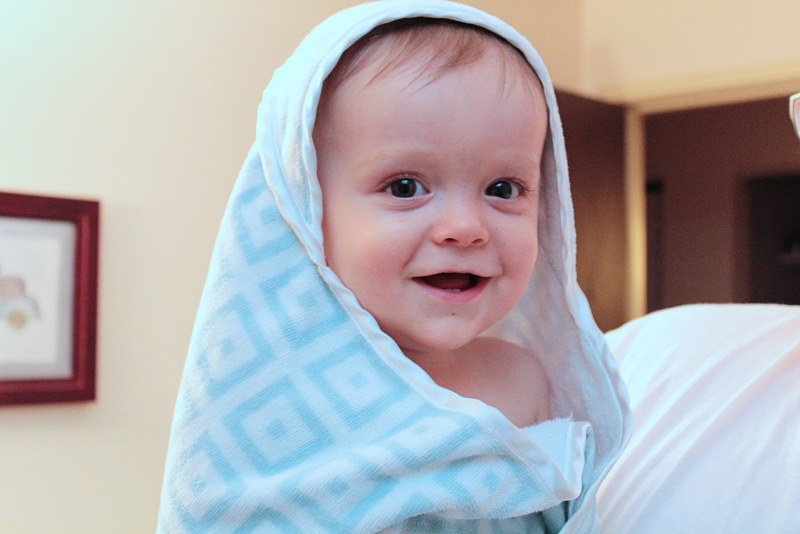 I've talked on the blog a bit about how we had sleep issues with Harry until a few weeks ago. Starting when he was about eight and a half months he stopped sleeping through the night consistently. Then he stopped going to bed at his normal time and was up until ten or eleven every night, and would wake up a few hours later. While I am a total night owl, staying up until three a.m. every night with a fussy baby was a nightmare. Something had to be done. So we went to the library and checked out The Sleep Easy Solution by Jennifer Waldburger and Jill Spivack. The Sleep Easy Solution is basically modified cry it out (CIO). CIO is very controversial these days, and I can't say I'm a fan of the method. I know it has worked for many families but true CIO would be a very last resort for me. Since the Sleep Easy Solution isn't true CIO I was interested in seeing what the book had to say. I was very pleased with what I read! Here are a few key points that really resonated with me. Pick a bedtime and stick with it. We majorly failed this one. We figured he wasn't tired, but in fact he was probably over tired by the time he finally fell asleep. Fill the crib with pacifiers. This one sounded kind of silly, but it totally makes sense. Having five or six pacis at his disposal makes it easy for him to find one so he can soothe himself back to sleep. Put your baby in the crib awake. Did you catch that? Put your baby in the crib awake. We used to be awesome at doing this. And Harry was awesome at sleeping through the night. Then we started rocking him to sleep more and more and he slept through the night less and less. Notice a pattern? We started the Sleep Easy Solution on August 29th. The first night was surprisingly easy. Unfortunately the following two weeks weren't so easy. The first week we'd go in after two minutes of crying. The book recommends waiting ten minutes, but that was too long for me. A few nights during the second week we waited five minutes before going in, but that's as long as I would go. He never cried for longer than 15 minutes total each night. 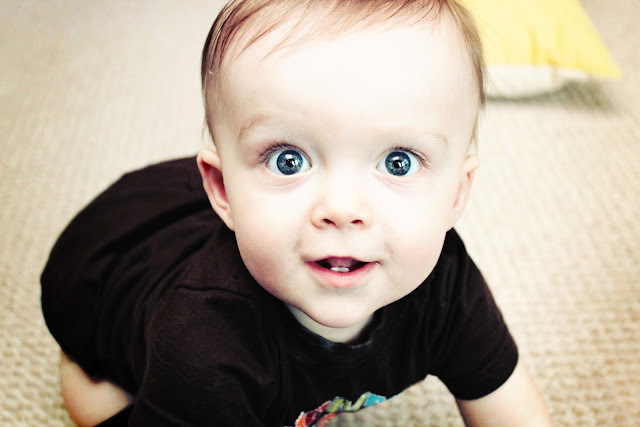 After about two weeks it clicked for Harry and he stopped crying at all when we left his room. Success! Ever since it's been smooth sailing at bedtime (knock on wood). So, why did we need to sleep train in the first place? When Harry learned to pull himself up in his crib it was ridiculously hard to get him to fall asleep. As soon as we put him in the crib he'd stand up. So, I started rocking him to sleep in my arms and then transferring him to the crib. That's right around the time he stopped sleeping through the night. How come? Well, wouldn't you freak out if you woke up in a different place from where you fell asleep? That was our biggest faux paux. He still wakes up during the night on occasion but never cries and falls back asleep after a few minutes of playing with his pacifier. 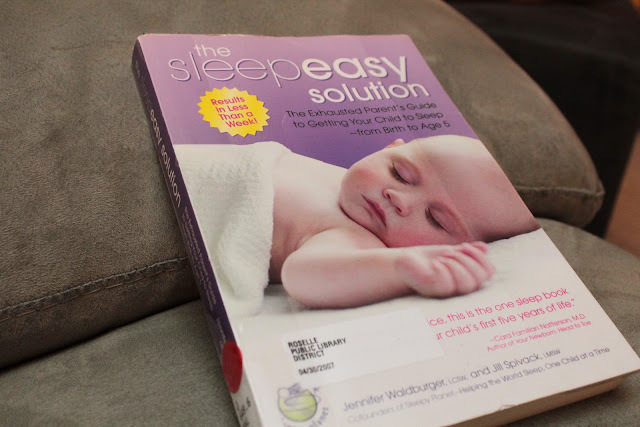 I highly recommend every parent read the Sleep Easy Solution. Even if you're against any form of CIO, it offers a lot of valuable insight into the sleep habits of babies and toddlers. And of course Harry didn't sleep through the night last night. How's that for ironic? He was super stuffed up yesterday so I figured he'd have a rough night. Poor baby, hope today's easier on him! That darn rash looked like yeast, so I disinfected Harry's cloth diapers and treated him with Lotrimin AF. As soon as we switched back to the cloth diapers the rash returned. I was stumped. I made an appointment with Dr. Google and concluded it must simply be chafing. It made sense because the rash started not long after he started crawling. Fortunately there is a simple and inexpensive solution to diaper chafing. 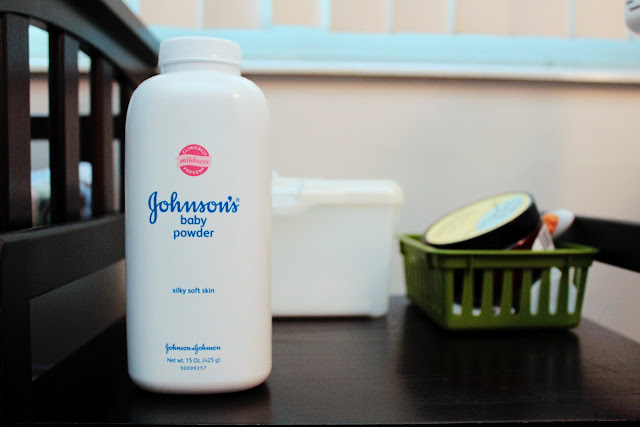 Plain old Johnson's baby powder. In just a few days of using it his rash has almost disappeared. Yay! I was pretty anti-baby powder since the powder can cause respiratory problems if inhaled. 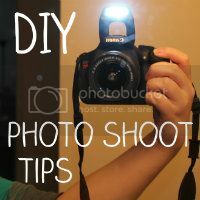 Because of the risks I've been very careful using it around Harry. 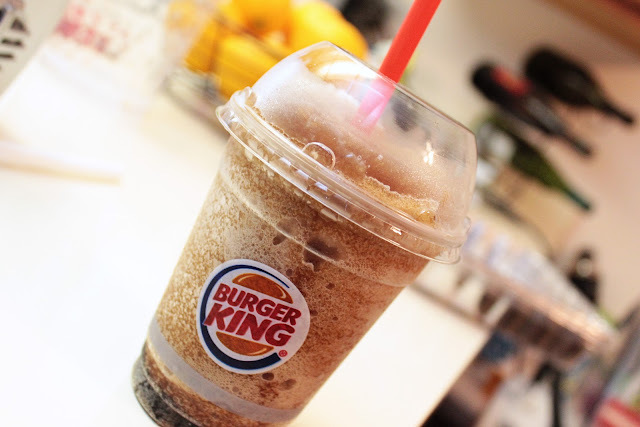 Shaking the powder out creates less dust than squeezing the bottle. Right now I'm using a little at every diaper change to make sure the rash stays away but will switch to just once or twice a day soon. I'm telling you guys, this stuff has been a lifesaver! Switching gears... I mentioned in my finger foods post last week that I was having trouble finding meats to give Harry. I'm happy to say this week he's been eating a lot of protein! We picked up some low sodium turkey slices from the deli last week. Someone loves it! Last night I made a turkey burger for Harry as well. It was a little thick for him so he only ate a quarter of the patty. I won our Emmy ballot last night! Harry and Ant tied for second place. 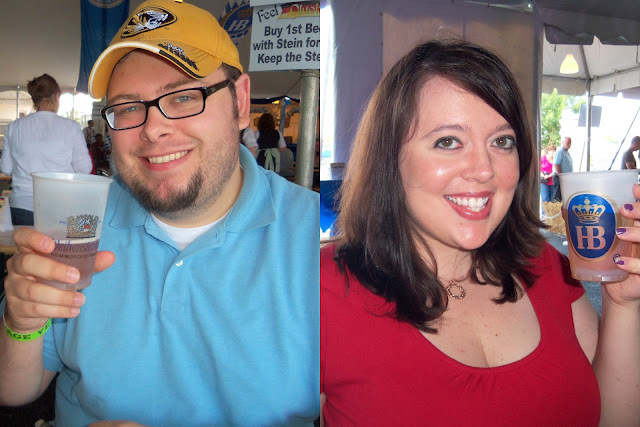 Here are my past fashion roundups. I have no idea who Lena Headey is, but holy smokes did she look amazing. Her look was my favorite of the evening. She looks like a Gothic princess. I love how there is so much fabric yet the dress doesn't seem heavy or bulky. Simply stunning! Julianne often ends up on worst dressed lists in my opinion, but she knocked it out of the park last night. I am in love with her dress. The color, the fit, everything is just perfect! Leslie Mann looked so fun and happy last night! In doing some research for this post I noticed her look has already ended up on a few worst dressed lists, but I must disagree. I love the whole look, including the turquoise jewelry, I think it really stands out against the marigold color of the skirt. As soon as I saw Jena walk down the red carpet I knew I didn't like her dress, but I couldn't figure out why. It took me a few minutes, but then I realized that her dress would look amazing on someone nine months pregnant. The lack of any sort of defined waistline is really off putting. Not a good look for someone who is clearly not gestating life. Andplusalso, no one should wear shoes with that thick of a strap. Speaking of pregnancy... Claire Danes' maternity frock was one of the most unflattering maternity looks I've ever seen. It looked like a potato sack. Just because you're preggers doesn't mean you can't wear something form fitting. I actually love dresses that hug baby bumps! Can can, can you do the can can, Elisabeth? This picture actually makes the dress look somewhat flattering on her, but obviously, the pattern is hideous. What were your hits and misses from the Emmys last night? Friday night we watched two movies Ant has been wanting to rent for like ever... What to Expect When You're Expecting and the Katy Perry concert movie! Or not :). I mentioned Thursday that I had wanted to see both and when Ant went to the Redbox he surprisingly came home with both movies. What to Expect was decent, entertaining if nothing else. I liked the dad's group scenes the best. We both really enjoyed the Katy Perry movie. Katy is one of my favorite singers and I thought the movie was a good mix of concert footage and behind the scenes stuff. Yesterday morning we got our car seat inspected at our hospital. I know, I know, it's something we should have done a while ago. I'm so glad we went and got it checked because the inspectors put pool noodles underneath the seat to get it balanced, something we thought we had done correctly. 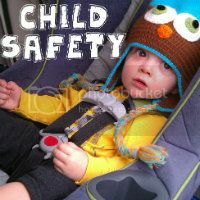 If you have a kid in any style car seat, please get it checked! Even if you think it's installed the right way it's always a good idea to have it checked over by a professional. After the hospital we headed to a barbecue with a few families from my mom's group. 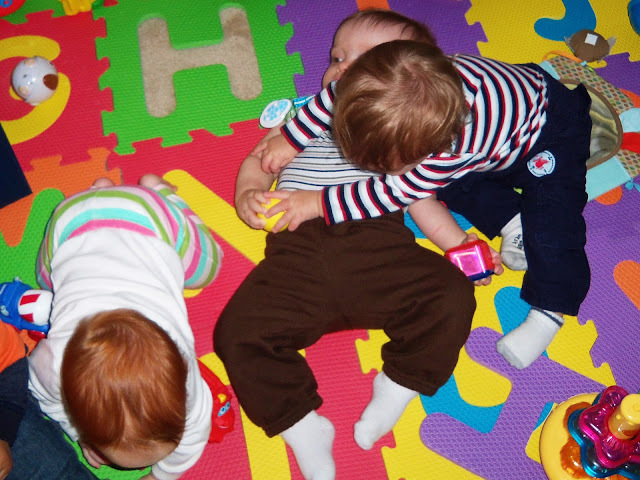 Now that all our babies are older it was really fun watching them play together. However, it was impossible to get a picture of all the babies looking at the camera. And then Harry got tackled. Silly babies! It was a lovely time and a bunch of us are hoping to get together next weekend as well. We don't have any major plans for today, except for watching the Emmy Awards tonight. As usual we filled out ballots last night. I'll let you guys know who wins tomorrow in my fashion post! In honor of National Child Passenger Safety Week, here are a few reminders on how to properly use a car seat. Some of this information might sound obvious, but I have seen so many car seats being misused that I think it's an important refresher for all parents. The seat in the picture is not being used properly. That little claspy thing? It's called a chest clip. It is intended to be worn at...wait for it....the chest! It should be even with baby's armpits. Wearing the clip lower than it's supposed to can cause serious damage to internal organs because baby's sternum is not acting as a barrier to protect them. The baby could also fly out of the seat if it's too low. 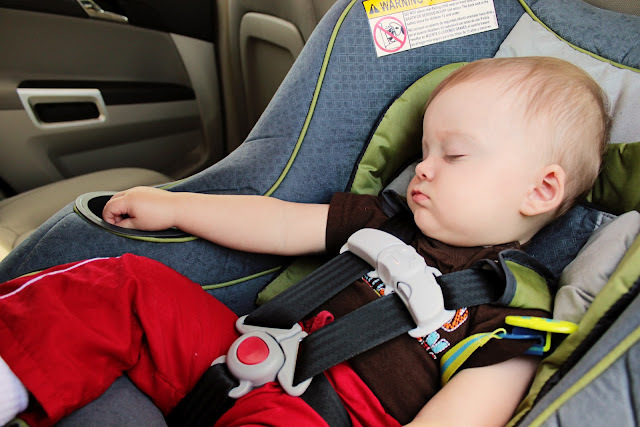 Most car seat accessories are unapproved for use and will void your warranty. More importantly, they can affect how the seat performs in an accident. 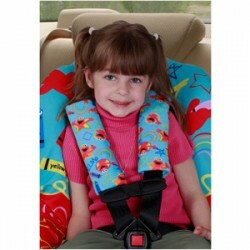 Things like Bundle Mes, strap cushions and chair covers should never be used with your car seat. Some car seats, including ours, have strap covers that come with the seat. Those should be used with your seat, but ones that were purchased separately should not be used. Mirrors that attach to the seat are also dangerous, for a couple reasons. 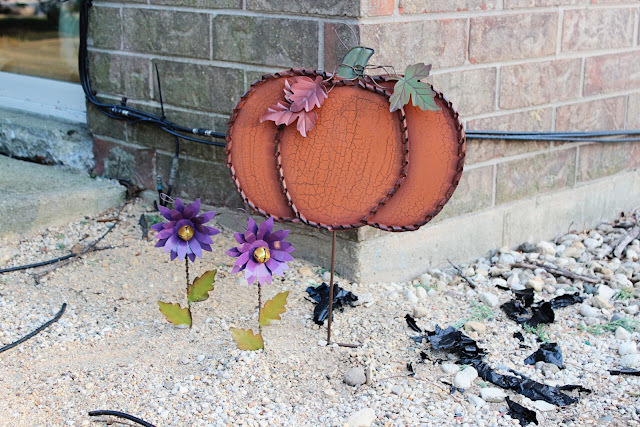 First, they can distract parents while driving and they could fly off during an accident. We bought one when I was pregnant but never used it. 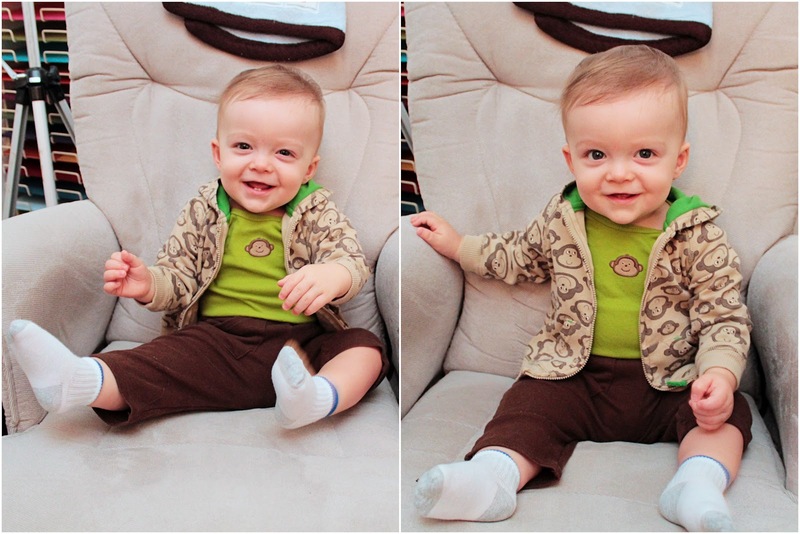 Last winter when Harry was in his infant seat we used a First Years car seat cover. These, and similar products, are perfectly safe to use because nothing goes behind the baby to affect the way the seat works. They were even recommended at the car seat safety class we took through our hospital. Bulky, puffy clothes should not be worn while the child is in a car seat. If you have to adjust the straps to fit properly, the clothes are too bulky. As I mentioned above, straps are meant to fit snugly. 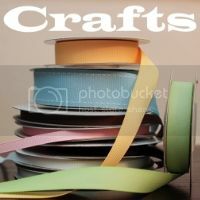 If you remove the bulky layer of clothes, the straps will no longer fit as they should. 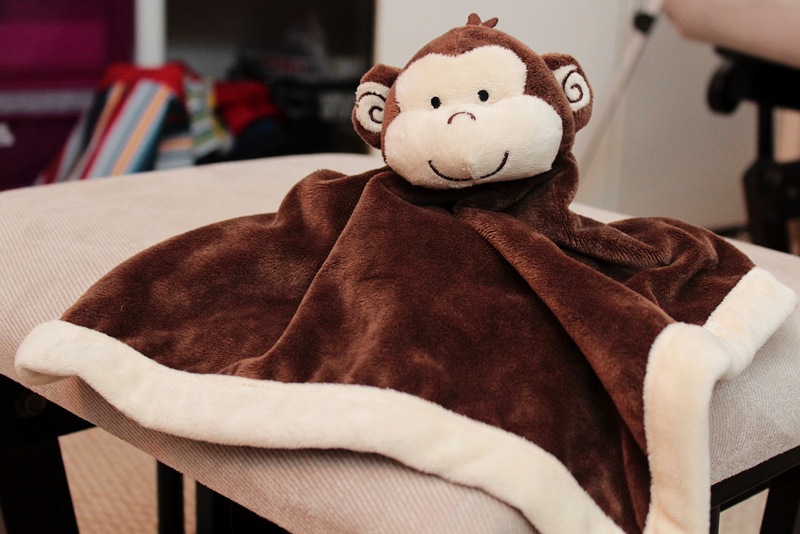 Fleece jackets are great for winter because they keep baby warm without adding any bulk. Those are just a few tips for using your car seat safely. Feel free to pass the info along! 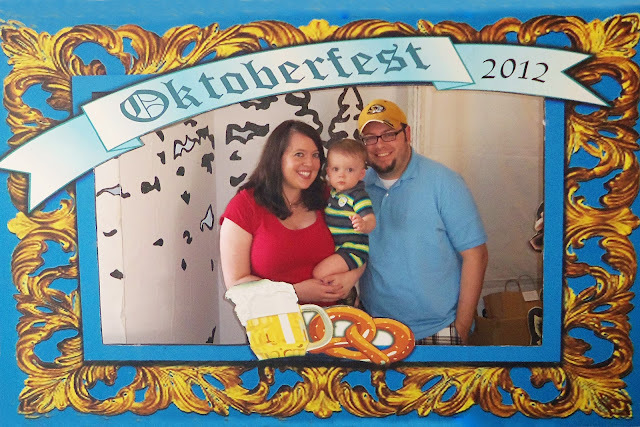 I've seen way too many photos posted Facebook with kids in their seats improperly. It breaks my heart that so many parents are undereducated on car seat safety. Disclaimer: I am not a certified Child Passenger Safety Technician, but I have done a lot of research on car seat safety. Please consult your car seat's manual for safety specifics regarding your seat. Ya know, I thought I was doing the right thing by keeping Harry away from wheat (gluten) for his first year of life. There are of course differing opinions out there, but it it couldn't hurt... so I thought. Instead of wheat, we give Harry a lot of rice-based foods. Yesterday I came across this article. WHA!!??!?!? There are concerning levels of arsenic in rice. It's in pretty much all rice-based foods. The article says to limit children's intake of rice. Fuuuuuuuuuuuuuuu-dgie the whale. Looks like someone will probably start eating wheat-based stuff a little earlier than planned. He actually has had a minimal amount of wheat already. We bought some YoToddler yogurt back in June or July and didn't realize there was some cereal in it, whoops. And if gluten is passed through breast milk then he also had some while I was pumping. Look at how cute Harry's outfit was yesterday. I love that hoodie! We bought it at Once Upon a Child last year. Is anyone else excited for the return of Parks and Rec and The Office tonight? Parks and Rec was epic last season so I'm really looking forward to it. The promos are very promising. I'm a little more apprehensive about The Office, my alltimenumberone favorite TV show (seasons 1-5). The past couple of seasons have been terrible so I'm really crossing my fingers they redeem themselves for the last season. The show's original show runner is back to hopefully bring the show back to it's prime. Here's a great look back at the past eight seasons. A few weeks ago I mentioned that Harry had what we suspected was a yeast infection. We treated his rash with Lotrimin AF and his rash cleared up within a few days. 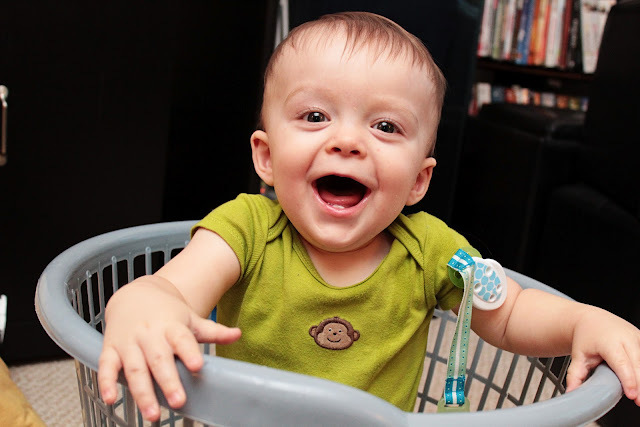 The rash returned when we started using our cloth diapers again. Something I should have foreseen, but I was in denial about having to disinfect the diapers just weeks after stripping them. Disinfecting diapers is different from stripping them, but it takes about the same amount of time. 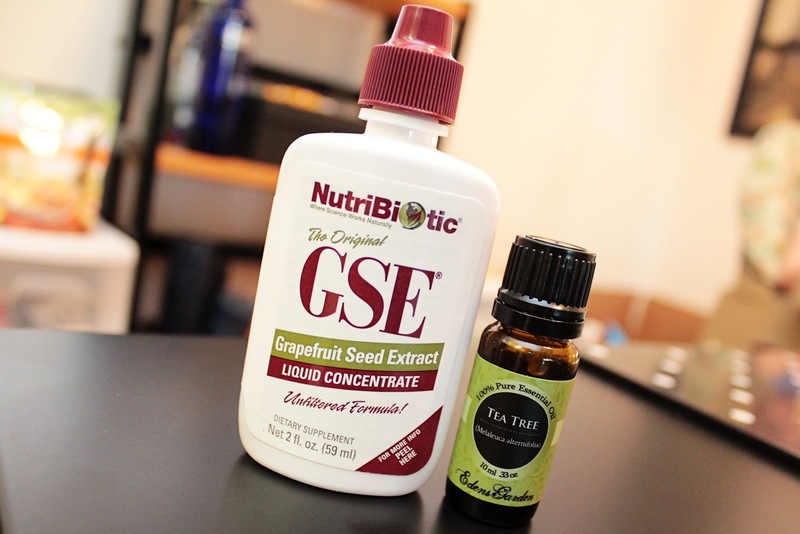 To disinfect my diapers I used grapefruit seed extract and tea tree oil. I've heard you can use just one or the other, but I decided to try both. 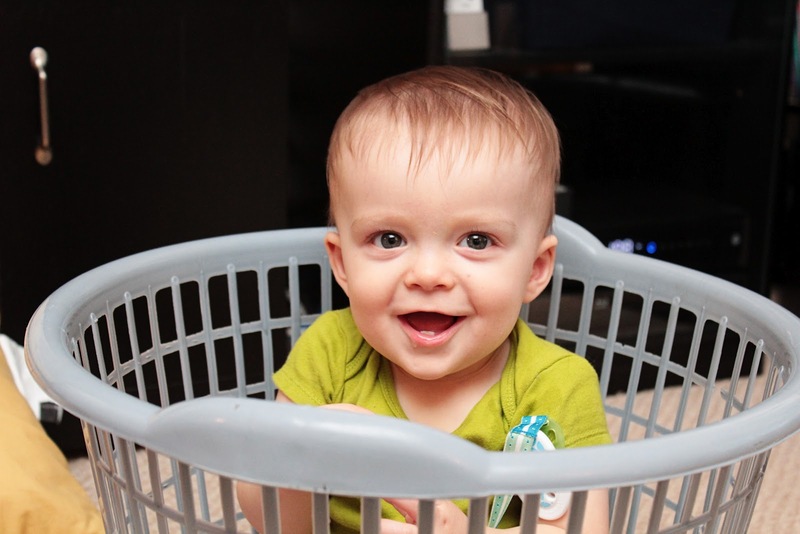 I stared with clean diapers and then did a full wash with about 25 drops of tea tree oil (remember, I have a half-size washer, so you'll probably want to use 50 in a regular machine). Then I did another full wash with 50 drops of the grapefruit seed extract. After the washes I did two extra rinses and finally threw everything in the dryer. I washed/rinsed everything in hot water. Today will be our first day back in cloth after being in disposables 24/7 for the past 3 days while I disinfected all our diapers. I feel like he's been in Huggies more this month than cloth this month which I'm none too happy about, but it's important we get this yeast thing under control. Cross your fingers it works for us! Just for fun, here's an adorable picture of Harry I snapped yesterday while he was enjoying some freeze-dried bananas. 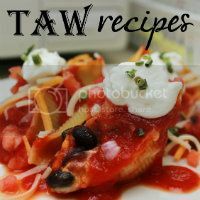 Yesterday I renamed the Beyond TAW page to As Seen On... 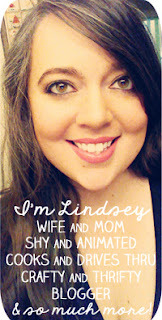 Yesterday I was featured on the Daily Buzz Moms' Top 9 which was so exciting! 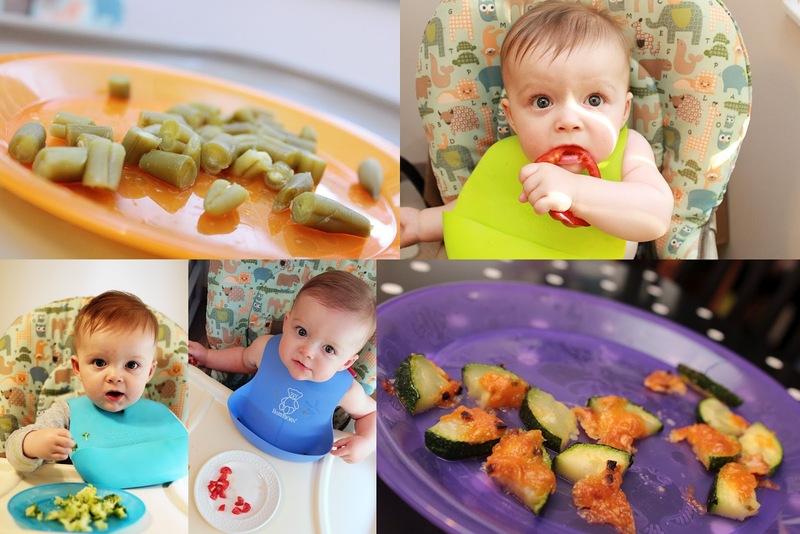 If you didn't go the baby lead weaning route with introducing solids, incorporating finger foods in to your little one's diet can be a challenge. 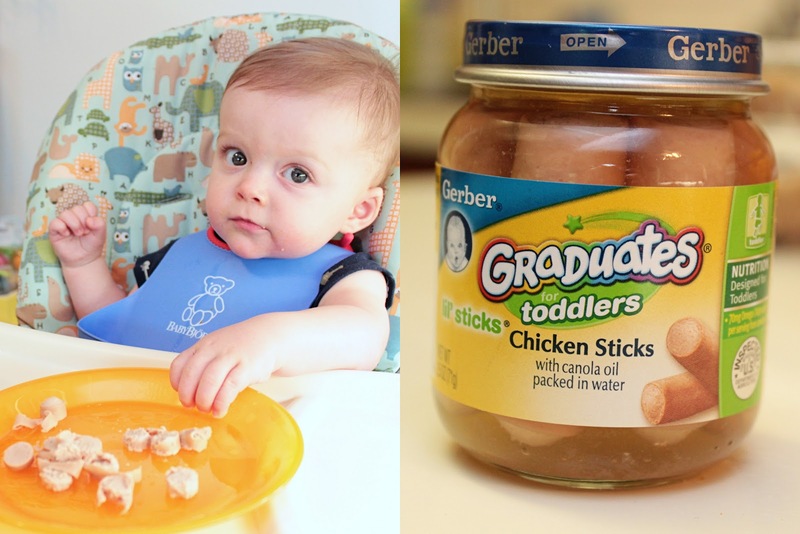 The baby food aisle at Target or Walmart is a good place to start. Mum-Mums and Happy Baby Puffs were a big hit with Harry when we first ventured away from purees. And while those are great at the beginning, they become boring after a while. 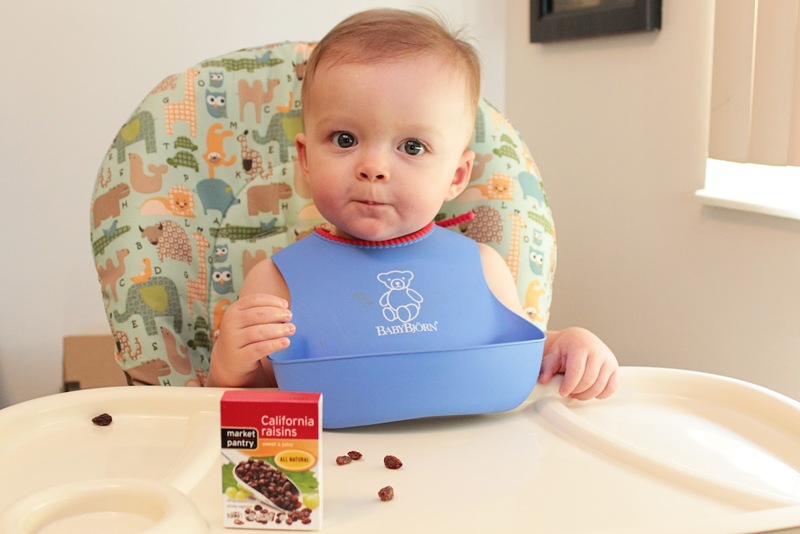 Here are some great ideas of what to feed your older baby (seven to eight months and up). And it's all mostly stuff from the regular, big people section of the store! We bought these freeze dried peas and corn at Target. They are the Archer Farms brand. 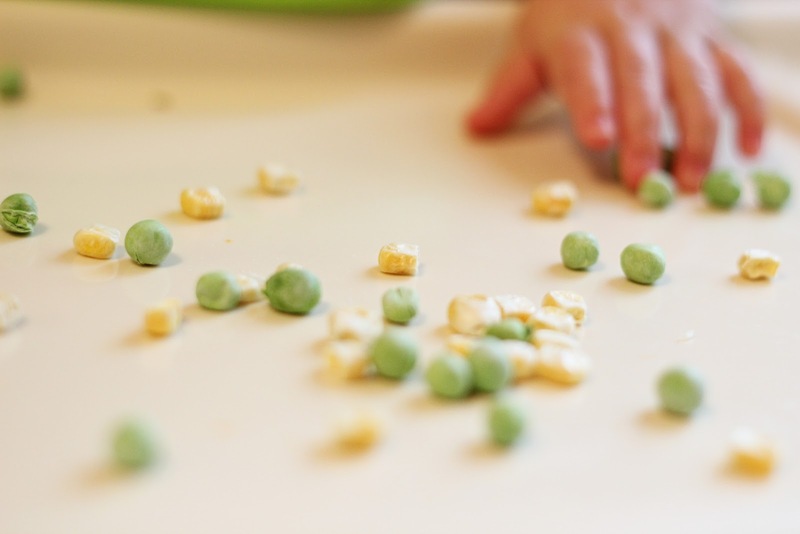 Freeze dried and veggies are a great alternative to puffs. 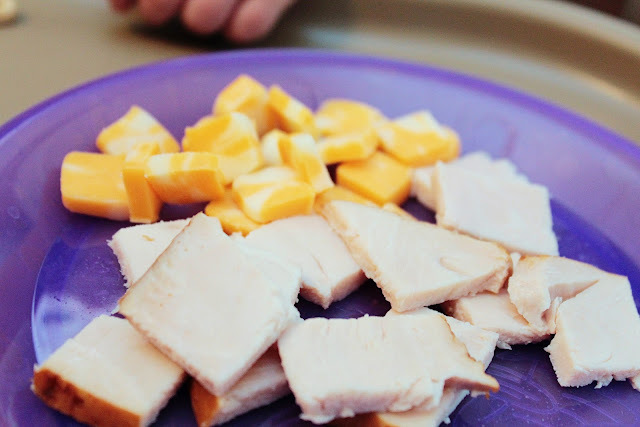 They're easy for little hands to grab and can be stored just about anywhere, making them a perfect on-the-go snack. Freeze dried fruits are also a good option, but the pieces are a little bigger so you'll want to break them up. Be careful as some varieties have added sugar (bananas don't, but peaches do). Keep servings to a handful every day to every other day. Too many of these (specifically the veggies) may cause digestive issues that can make for a fussy, uncomfortable baby. Harry loves cheese! Sometimes I'll give him shreds of cheddar or mozzarella, but I usually cut up a string cheese for him. He's been loving the Kraft tomato basil string cheese lately. Grapes are still a little hard for Harry to eat on his own. Plus, when I cut them up the sticky juices get all over his face and hands. This mom's worst nightmare!. But raisins are wonderful. Not only are they less messy but they are very easy for him to "chew." 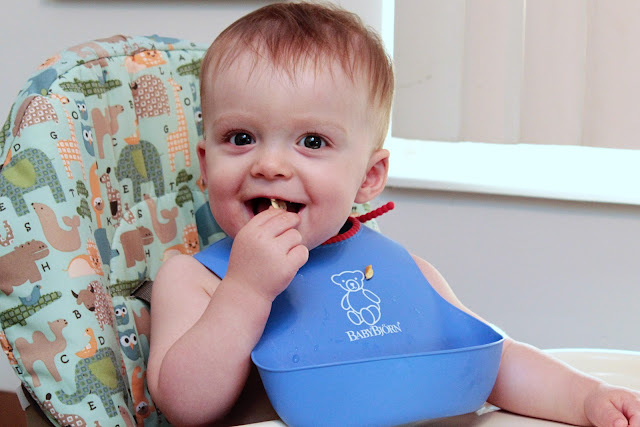 Pasta is such a great finger food for babies. We are keeping Harry gluten free until his first birthday so we give him Tinkyada rice pasta we bought at Super Target. I'm too chicken to try it myself, but he seems to love it. Babies don't know that pasta is usually eaten with sauce, so you can go crazy with what you serve with it :). 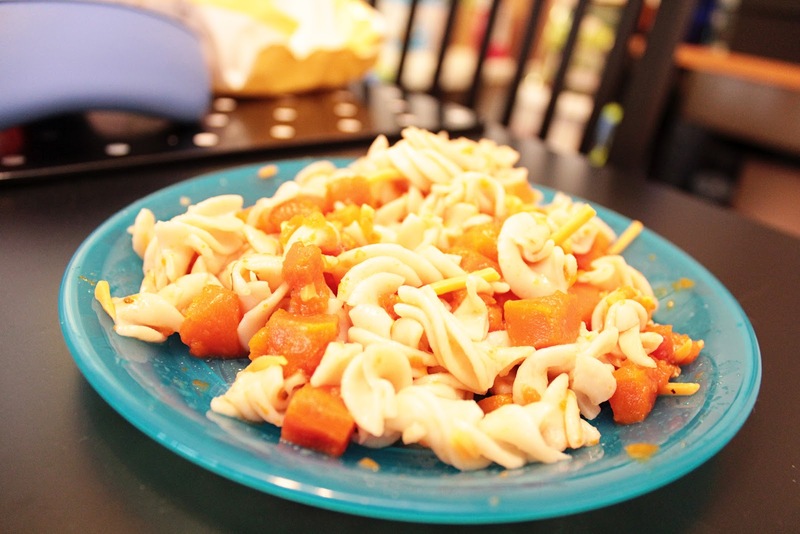 In the above picture I mixed the pasta with carrots (Gerber Pick Ups), shreds of cheddar cheese, hard boiled egg yolks and a spoonful of pasta sauce. Also, if your baby is now refusing purees, spoon them on to pasta for a flavorful sauce so they don't go to waste! We started first with giving him hard boiled egg yolks. Egg whites are high on the allergy list for babies, though I've read so many contrasting reports on the subject. A couple weeks ago I gave him a few small pieces of egg white. A few days later I gave him some potato salad without thinking about the mayonnaise in it. He didn't have any reaction so a few days ago I whipped up a scrambled egg for him. 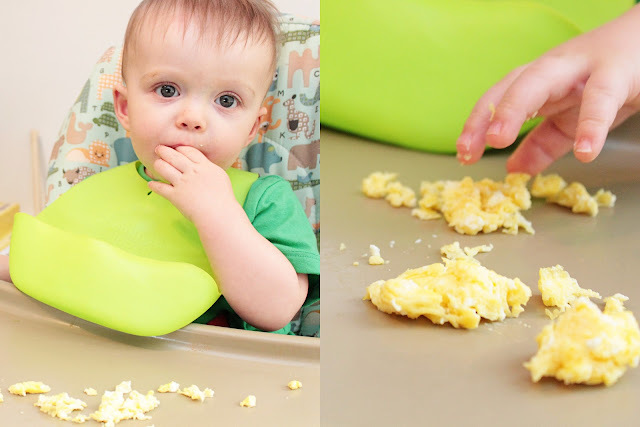 He wasn't sure what to do at first, but quickly warmed up to it and finished the entire egg. 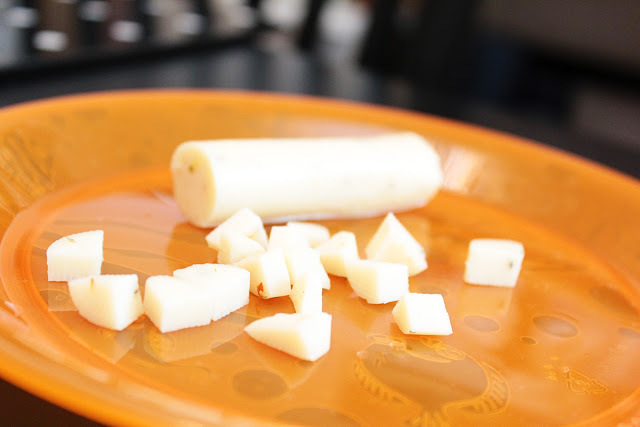 Try jazzing up baby's eggs with a pinch of shredded cheese or some oregano. Meat is something I've struggled with. Making my own meat purees grosses me out, so I've bought them in the past. But as far as finger foods, I'm lost. I thought about doing turkey hot dogs but I'm not crazy about a lot of the ingredients, so I went with Gerber meat sticks. They're not much healthier than hot dogs, but he eats one jar a week at most, spread over a few days. Other than meat sticks and purees Harry will eat pieces of whatever meat I prepare for the grownups. Let me know what kind of meat you give your baby. I'm all ears!! Would pieces of low-sodium deli meat be a good option? 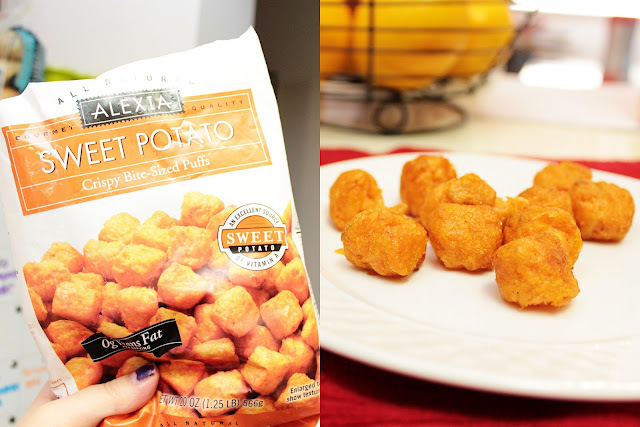 Maybe not the healthiest option, but sweet potatoes are considered a super food and they're really easy to prepare. The sweet potato tots are a little big for his hands so I break them up for easy handling. Keeping Harry gluten free for the first year has been tough. There are so many foods I know he would love that we're holding off on. At the grocery store a few weeks ago I saw some corn tortillas and was mad at myself for not thinking of giving these to Harry sooner. 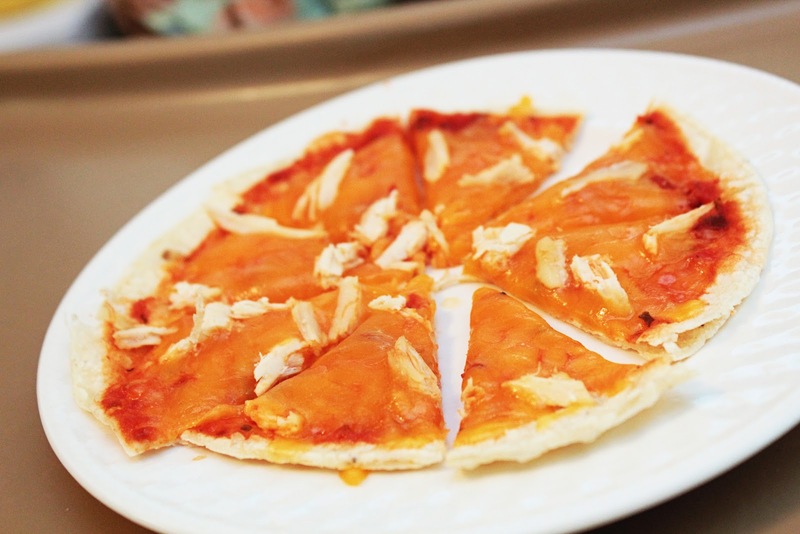 Spoon a little pasta sauce on a tortilla, top it with cheese and a little shredded chicken and microwave it for 30 seconds (you could also use the toaster oven for a crispier pizza). There are tons of different ways you can prepare tortillas for babies. Stop pureeing your fruits and veggies and start giving your baby little chunks. I always try to cook a vegetable with dinner so Harry usually has some with us. Some of his favorites include canned green beans (my favorite kind! ), tomatoes, zucchini and cauliflower. He was really liking broccoli until recently, when he ate everything on his plate except for the florets! In regards to fresh fruits, Harry likes watermelon, small chunks of apples and strawberries. I'm not a big fruit person so I don't think to buy a large variety at the store. Here are some other finger food ideas. 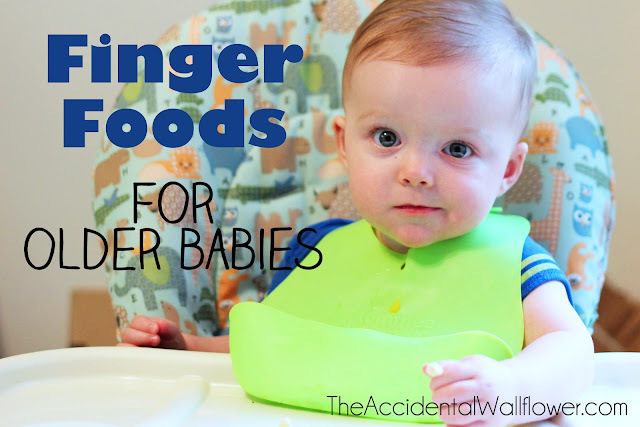 WHAT KINDS OF FINGER FOODS DO YOU GIVE YOUR BABY? SOUND OFF IN THE COMMENTS BELOW! Disclaimer: I am not a trained medical professional or licensed nutritionist. I take no responsibility for what you feed your children. These are merely suggestions based on what has worked for my son and others I have spoken with.